As he has always ruled with his brother, Raúl Castro did not need to wait for power. Instead, he preferred to walk in the shadows because having one of them to face the music was enough. It was Fidel Castro who was permanently and overwhelmingly in the public eye. While he always took responsibility for everything that happened, they both shared the blame for the grave upheaval they have caused to the country, its economy, its society and the youth of today. Raúl maintained good relations with their mother, who favored him because of his tenderness and love for her. However, it was he who brought home bad grades on exams and complaints for his bad behavior in Catholic school, which he accused of ” “being like a prison” on more than one occasion. It’s true that, historically, the public record of Raúl’s activities has always been inferior to that of his brother, but even so, his history as a politician has been known since 1950 when, at age 19, he enrolled at the University of Havana to study Public Administration, and debuted as a Communist in the student newspaper, Saeta, with a violent writing against the United States in relation to the Korean War. In Mexico, Alberto Bayo, the Red General, who taught the tactics of guerilla warfare to Fidel and his group, gave a precise and striking description of Raúl when he saw Raul insist that a member of the 26th of July Movement be shot for insubordination. “Those who think about killing Fidel do not know, do not have the slightest idea that this man, that is Raúl, is Fidel multiplied by two in energy and in inflexibility because he has a character of steel,” Bayo said at the time. The old Bayo, without a doubt, was correct when he said: In the first days of January in 1959, without having made any changes in the Constitution, he ordered that more than one hundred men, belonging to the recently disappeared regime of Fulgencio Batista, be shot without trial. On September 13, 1962, during the Cuban Missile Crisis, Raúl was misleading to warn the United States that, “the end of imperialism would be an attack on Cuba”. In April of 1993, after the collapse of the socialist camp and after having been decorated as an Army general in 1976, he confessed to the newspaper El Sol de México that in 1981, the Soviet leaders had confirmed to him that, “they could not have provided any assistance to Cuba, in case of an attack on the island from the United States”. One might ask: could this “general of steel” be able to take his tanks against its own people in the near future? 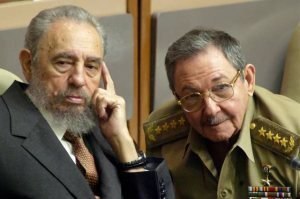 According to Rafael del Pino, ex-general of the Cuban Air Force and exiled in the United States, Fidel asked Raúl to take the Army to the streets in order to control the demonstrations of August 1994, remembered as “the maleconazo”. Raúl’s response was that this was not the solution. Was he, perhaps, thinking about the life of the crowds or that the social situation could be aggravated? The truth is that the order of his brother was not fulfilled and Raúl decided to revitalize the economy with the participation of the Cuban Army (FAR), something that has not yet been achieved. Today, the prices of food, wages, and monetary policy represent chaos in Cuban society, something that demonstrates that its administration is simply a failure. These days, some wonder when it really was that Raúl began to govern by himself. I have heard the answer from Cubans themselves, , especially from people who work as gardeners, carpenters, cooks, or maids in Punto 0, the exclusive district of the Castro family. It was in that place where he took refuge on June 24th, 2001, when the “Undefeated” collapsed on the floor before hundreds of people. Recovering minutes later, he told everyone, to address the doubts, that his succession was guaranteed by his brother Raúl. That same Raúl is the one who has not been able to prevent a simple glass of milk from becoming the greatest utopia of socialism, already with a weak “steely grip” and ruling through, “a model that already does not serve neither to us”, as in an occasion has slipped from Fidel’s mouth.